Joe Said So: Tech Tidbit: w00t! If you've ever visited a message board or a chat room on the internet, you may have seen the word 'w00t' tossed around and passed it off as a typo. 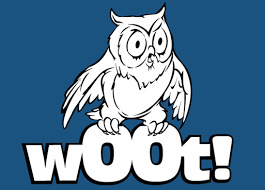 In fact, 'w00t' is internet slang used to express sheer joy or excitement as in 'yay' or 'hooray'. I know. So it's not really a word, right? Well, w00t was crowned Merriam-Webster's Word of the Year in 2007. What does that tell ya?